Students are often frustrated when I tell them that most highly selective colleges – and some less-selective colleges – recalculate GPAs using their own formulas, most of the time removing the weight for Honors and AP courses, and many times considering grades in only academic classes. They think that un-weighting their GPA is “unfair,” after they work hard taking rigorous courses in high school to distinguish themselves from their classmates. But in reality, colleges must have a starting point to compare students on an even playing field. So bringing everyone onto the same 4.0 scale gives colleges the ability to look at everyone from the same starting point. THAT’S NOT TO SAY THAT HONORS AND AP COURSES ARE NOT IMPORTANT!!! They are tremendously important. You can be sure that colleges pay attention to how many Honors and AP classes you take, and how many are available to you – and you get “credit” for working hard, I promise! You should take as rigorous a courseload as you can without it affecting your grades; that is to say, if you can take 2 AP classes and still get As in both of them, take them! If you can take three AP classes, get two As and a B, that’s still a good idea. If adding another Honors or AP class would bring any of the grades below a B, then it’s probably not a great idea. I know it’s hard to know what your grades will be in advance, but try to think about planning next semester’s or next year’s course schedule with this in mind. 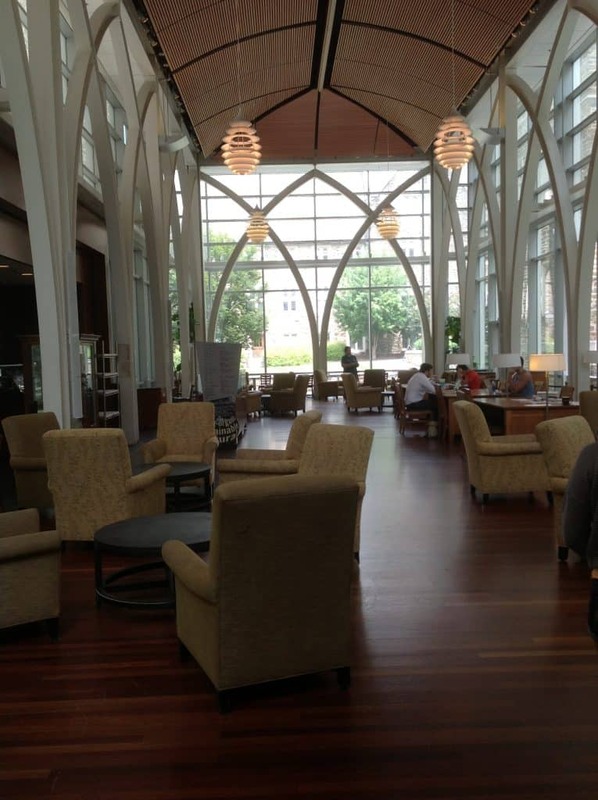 With regard to courses that colleges consider and don’t consider when they recalculate the GPA: know that colleges are looking to see how well you have done, and how well you will do, in ACADEMIC classes. They look at the five core academic areas: math, science, English, history (social studies) and language. The UCs and Cal States look at these core areas exclusively, the a-g requirements, which are basically the core courses plus one year of visual and performing arts, plus two years of physical education. This page on the College Board website summarizes what most selective/highly selective colleges look for (hint: they are looking for you to be taking rigorous course in high school! ), and the chart below shows how the Los Angeles Unified School District is moving its graduation requirements to align more closely with the a-g standards for the UC and Cal State systems. 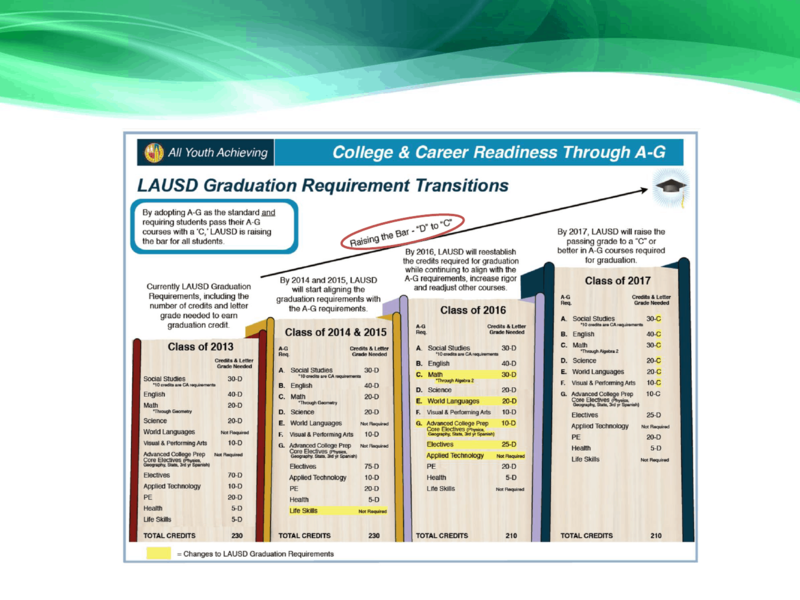 LAUSD’s a-g chart only tells you the minimum requirements. You should be taking rigorous courses in high school, beyond these minimums. But when it comes to competitiveness, students need to look not only at the number of AP and Honors courses they take, but also their electives. Remember that the three years of math, two years of language, two years of laboratory science, three years of social studies and four years of English are the MINIMUM that colleges want to see. That’s not to say you can’t take more, if you can fit it into your schedule. I’ve seen students taking electives that basically scream, “I want an easy A!” in courses that won’t figure into the GPA – which read as a waste of time to highly selective colleges. On the other hand, I am working with a senior who is taking not only Pre-calculus, but also Trig and Stats as well. If math is your strength, prove it! I’m working with a junior who plans on taking AP Chemistry as an elective next year, after having taken Bio, AP Bio AND Physics. Before you sign up for that advanced 3D design class or a second year of guitar (having already fulfilled your visual and performing arts requirement), think again about taking rigorous course in high school! Your schedule shows them your fortitude. Let it speak loudly for you.